Earlier this month, I had the privilege of serving as the tour guide/educator on a ten-day Taglit-Birthright Israel trip. This was the first time I have served in this role; I hope it will be the first of many such opportunities. As has been widely noted and acknowledged, Birthright is a phenomenally successful program. Begun 16 years ago as the bold initiative of a single American philanthropist, as of this summer the program has brought over half a million (!) young Jewish adults to Israel. For most participants, Birthright is the first time they have been to Israel; in many cases it is the first meaningful Jewish experience of their lives. Statistics have shown a marked uptick in connection to Israel and engagement with Jewish life among Birthright participants. I can personally attest to the lasting impact this trip has made on some young American Jews with whom my family and I are acquainted. Therefore, I considered it a great privilege to be able to lead such an encounter. Interestingly, the group I was given for my first Birthright experience was far from typical. Although the participants in my trip met the ordinary eligibility requirements (they were Jewish, between the ages of 18-26, and had not been to Israel for more than three months since the age of 12 – in fact most had never been here at all), they did not match the profile of the average Birthright participant. This is because my group was a specially-organized “niche” trip geared towards the “ultra-Orthodox” population. It was comprised of nine married couples from the Hasidic communities of Brooklyn and Monsey, and another 22 single women, mostly graduates of “Bais Yaakov” high schools in New York and New Jersey. The trip was an incredible, enlightening and uplifting experience for all. Beyond this, though, the trip was a learning experience for everyone involved. For the participants, this trip accomplished all the things that a “regular” Birthright trip does, and maybe more, starting with the fact that they got to see the land of Israel, in most cases for the first time. I don’t know if I will ever forget the exhilaration I felt on the fourth day of the trip as we ascended to Jerusalem after several days in the north, singing “Im eshkachech Yerushalayim” (“If I forget you, O Jerusalem” – Psalms 137:5) as the bus slowly climbed the hills past Maaleh Adumim. For most of the participants, this was the first time in their lives they had entered the holy city. What a privilege to be able to facilitate that! Although they have a much stronger background in Jewish studies than the typical Birthright participant, concepts such as Zionism, the Israeli government and army were very new to them. Of course it did not surprise me that, just like many Birthright groups, during the closing session a large number of participants listed Friday night prayers at the Western Wall as one of the most meaningful moments of their trip. But I was amazed that so many of them also mentioned the visits to the Har Herzl military cemetery in Jerusalem and to Independence Hall in Tel Aviv. 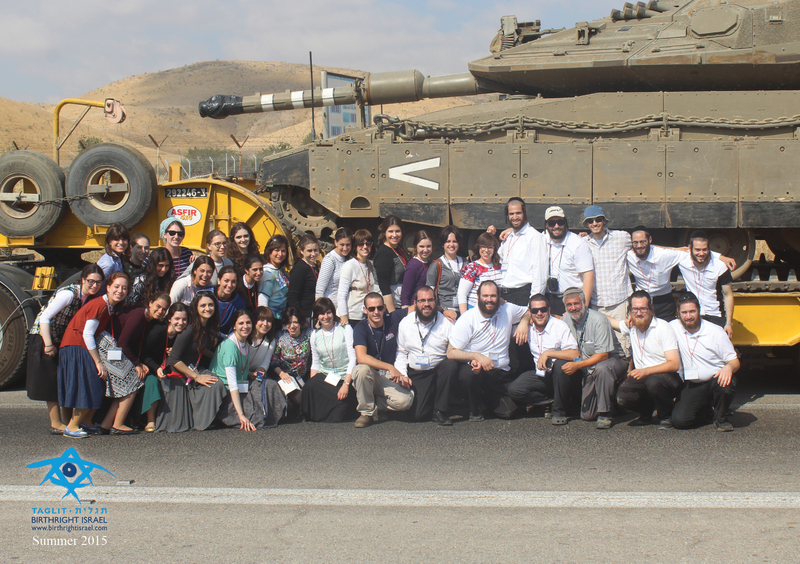 The group picture (above) taken spontaneously in front of a Merkava tank parked on a flatbed truck at the side of a road shows how significant this experience was for everyone. But it wasn’t only the participants who learned a lot on this trip. I (and some of my family who joined for Shabbat) learned just as much from them as well. Having lived in Monsey, NY before making Aliya, and having subsequently worked for many years in a haredi neighborhood in Jerusalem, I have had many opportunities to interact with haredim and Hasidim. Still, spending ten intense days together enabled me to get to know them and to experience their world in a deeper way than I have been able to previously do. Seeing how they reacted to sites like Rabbi Shimon bar Yochai’s grave on Har Meron and Rabbi Yonatan ben Uziel’s at Amuka (especially for the young women; this site is considered a very auspicious location to pray for an appropriate shidduch) was eye-opening for me. Sitting down after dinner on Friday night with the entire group for an hour and a half of singing (I usually call things like that an “Oneg”, but apparently it’s called something like “butteh” in Yiddish) with refreshments purchased by the participants themselves was also amazing. The interactions among the participants from different communities, and the amount of respect, openness and genuine interest that they showed towards Jews from the National Religious and mesorati (Traditional) communities who they met during the trip was also very noteworthy. In the end, perhaps the greatest lesson of this trip was that despite the unique religious and cultural demographic, ultimately this was a Birthright trip like any other. According to the Birthright organization, the objective of the trip is “to ensure the future of the Jewish people by strengthening Jewish identity, Jewish communities and connection with Israel…to foster participants’ understanding and identification with Israel, and…motivate young people to continue to explore their Jewish identity.” I watched that miracle happen over a mere ten days with these 40 young adults, in pretty much exactly the same way it does for tens of thousands of others every year. Maybe the biggest lesson of this is that despite our tendency to focus endlessly on the religious, ideological and political differences that divide us into a seemingly infinite amount of groups and sub-groups, we Jews are still one people, which so much more that should unite us and bring us together. This entry was posted in Uncategorized on August 30, 2015 by rabbihaber.